It's just as simple to make, too. 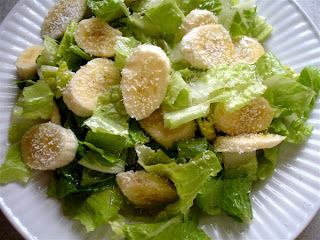 Chop the romaine and toss with sliced bananas. 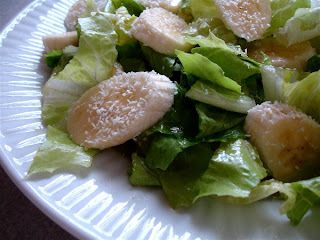 In a small cup, whisk together the lemon juice, agave, and a pinch of salt and dress each salad. 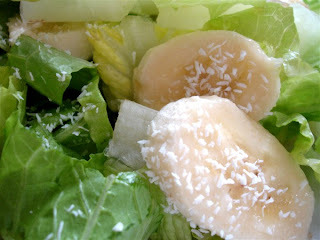 Sprinkle with coconut flakes. My little local grocery has had avocados on sale for the past few weeks or so and I've been making all sorts of things with them, but one of my favorites is creamy soups. 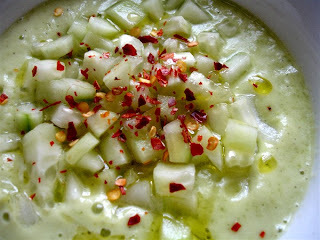 The cucumber adds a summery feel, too, even here where we have a foot and a half of snow! Finely dice a 2 inch piece of cucumber and set aside for later. 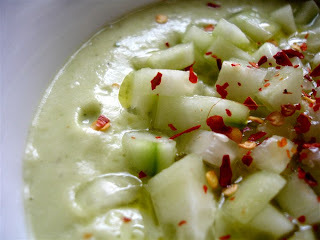 In a blender, puree rest of the cucumber, avocado, 1/4 of the onion, garlic, and olive oil. Chop the cucumber and avocado first to make blending easier. Add the water as needed for blending. Let this blend for a minute or two, to get really creamy. Salt and pepper to taste. 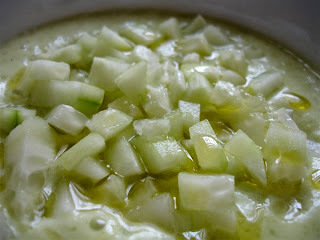 Top with a bit of the reserved diced cucumber and onion. Sprinkle with red pepper flakes and add a small drizzle of olive oil, if desired. 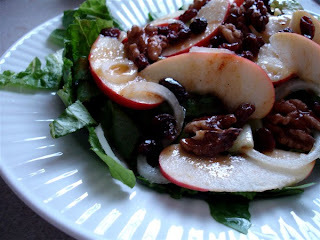 Chop the romaine and core and slice the apple. 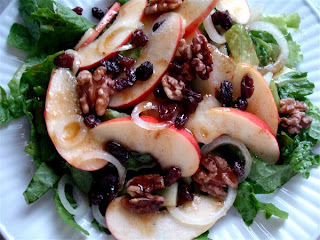 Toss with sliced onions, walnuts halves, and raisins. 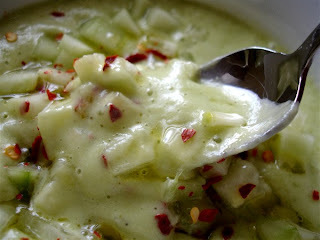 In a small cup, whisk together the olive oil, agave, lemon juice, vinegar and cinnamon for the dressing. Salt and pepper to taste. This is not a pretty pie. But many times you can't judge a book by its cover, and that was certainly the case with this dessert. I was pleasantly surprised at how good this tasted. It made a pretty big pie, too, but ended up being two servings. Core and peel the apple and cut in half. In a blender, puree one half of the apple with the olive oil, vanilla, and cinnamon, adding just enough water needed for blending. In a food processor fitted with an "S" blade, process the walnuts and raisins together until the mixture will stick together when pressed (about a minute). 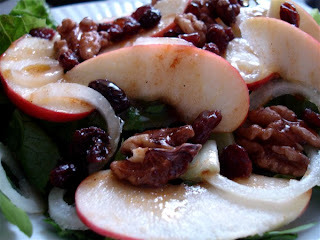 Press into a small pie plate, tart pan ... or just use a salad plat like I did. 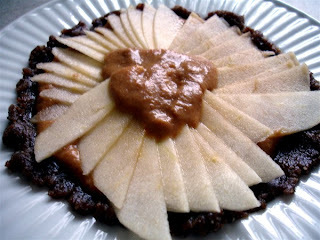 Top with the pureed apple mix. 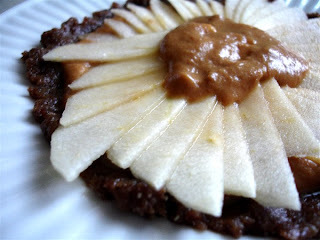 Thinly slice the remaining half of apple and arrange over the pureed apple mix. 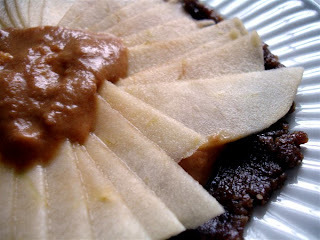 Add a small dollop of any left over apple puree to the top.